Dresden is a beautiful city...once known as Florence of the Elbe, this magnificent city was almost totally destroyed during the end of WW2. When I first started to visit some 13 years ago, many of the buildings which stand proud and beautiful today were in ruins...literally holes in the ground. Left by the GDR government of the day all through the years since the end of WW2. The Frauenkirche, the city's landmark was on the ground. 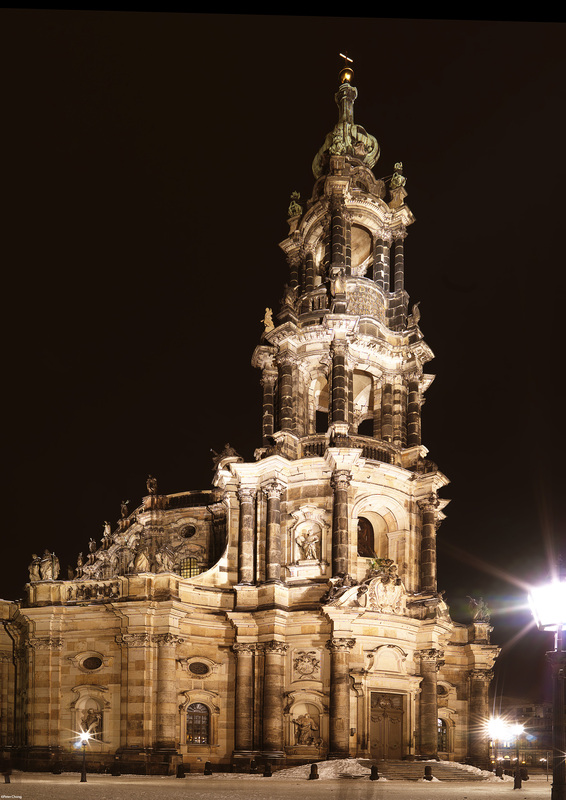 The amazing thing about Dresden is that it was decided to rebuild the city, piece by piece so that it returns to its former glory. Quite magnificent. Today's topic is the church called Hofkirche. Just next to the wall known as the Procession of Kings, and just next to the Dresden Castle. This is an interesting Catholic church, which was built by August the Strong, when he converted to catholism when he accended to the throne as King of Poland. I found great difficulty photographing the church. It had been an exceptionally early winter this year. Heavy snowfall started on Nov 28, and continued to fall. By Dec 5, when I took this photograph, more than half a meter of snow had fallen. And in some parts temperature had dipped below -19C. I setup my tripod in the middle of the small square leading to the Royal Stables, and had to point my camera up to capture the entire church. I should have done a vertical stitch with either the 80mm or 120mm, but the temperature took the better of me...it was -3.5C, but with the windchill factor about -15C, too cold for me, and under equipped in the clothing department, I was quickly freezing. I hastily setup, metered for the snow in the foreground, and placed that at zone 7. The different artificial lighting - flourescent mixed with tungsten mixed with mercury played havoc with the white balance. I straightened the perspective in CS4, and had to crop out the Dresden Tower, where F.A. Lange had lived because unbeknownst to me at the time of shooting, there was a big ugly truck at its foot. I intentionally included the strong lampost, shining bright on the right to create some tension in the image. I am still tweaking with the perspective control. Even with a slight stretch vertically, I think the perspective is incorrect. The windows on the church front, near the ground seems a bit oval...wider than its height, but the actual windows are oval, just perhaps not as much. But the top of the tower is begining to stretch over its natural limit. There must be a way to stretch the image based on a curve algorithm, such that it stretches more at the bottom than the top. Anybody have suggestions?